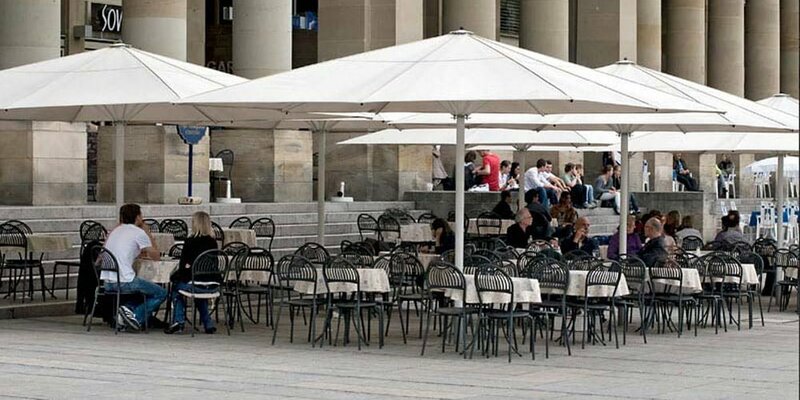 Designed to shade large areas, the Uhlmann XXL parasol can cover surfaces up to 78 sq.m. The square and rectangular umbrellas can be connected with “rain gutters” to provide extremely large shade for commercial and municipal applications. The Uhlmann XXL parasol is made with the highest grade materials. The XXL provides robust strength, while remaining easy to operate. The Uhlmann XXL parasol is manufactured with heavy duty aluminium frames. Ribs are in either 45mm x 25mm or 56mm x 31mm, depending on the size of the parasol. A winder system is integrated in the XXL parasol for easy opening of the parasol. The winder handle can be removed to avoid the possibility of the unit being tampered with. Guttering is available to connect the XXL parasols together. These can be customised to ensure that the rain water runs off in a particular direction. 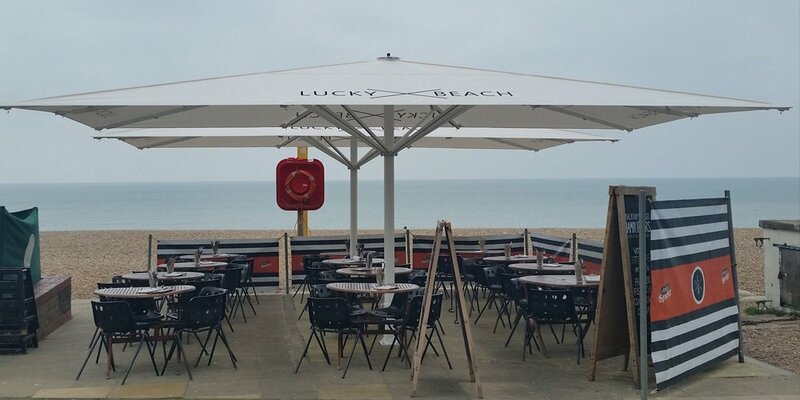 We strongly recommend that all XXL parasols are fully installed using in ground bases, set into large concrete footings. There are rare occasions when it is necessary to use a ‘portable’ base. This can be done for special events. 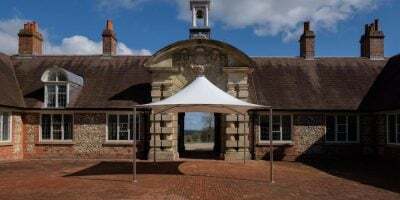 Uhlmann XXL parasol canopies are manufactured from either Airtex, or the recommended Dickson Orchestra fabric. 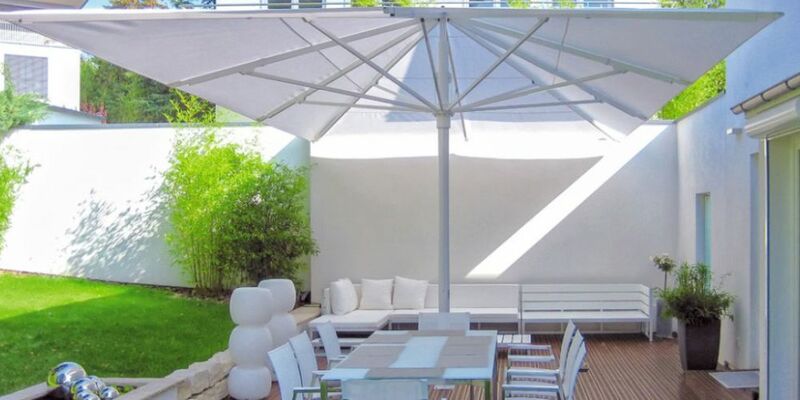 No air vents are available with XXL parasols, as this can affect the tension of the frame. Strength is maintained by using a canopy without an air vent. 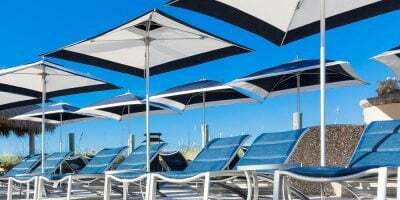 Optional: Side sheets can be ordered to enclose the parasol and protect the occupants from the weather. Cover bags are available to protect the parasol, and particularly the fabric when not in use. Infra-red electrical heating and lighting systems can be fitted to the underside of the XXL canopy. 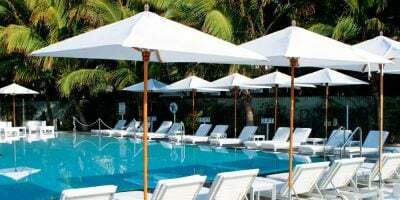 This can help maximise the amount of time that these parasols are utilised by extending their usability into the evening and colder months. Lighting is centrally mounted on the pole, utilising low wattage lighting units. Heating is provided by a number of infra-red electrical heater units. 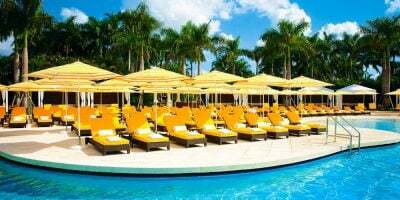 It is possible to put in a total of 6 heater units in to the XXL parasols, enough to heat the whole area. Heaters are available with a number of different power ratings, from 1.3kW to 2.0kW. All electrics are fitted at time of manufacture. NB: Electrics are installed within the frame of the parasol and need to be specified at the same time that the parasol is ordered.